Applications Closed for the 2019 García-Meza Scholarship, Dragons Global Education Fund, COMMON Foundation. Check back for 2020 opportunities Autumn 2019. 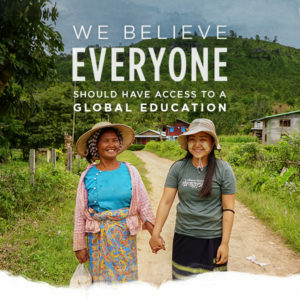 The Dragons Global Education Fund, a non-profit 501(c)(3) entity of the COMMON Foundation, provides needs-based scholarships to attend Where There Be Dragons programs, making it possible for individuals who would otherwise not have access. Both students and parents have shared their stories describing the immense value of the Dragons Global Education Fund. The COMMON Foundation is offering scholarships to Colorado-based practitioners who are not able to attend a meditation retreat due to financial constraints. One full-time scholarship will be awarded for each of the Zazenkai one-day retreats held by the Eon Zen Center between February – April 2019. In awarding the scholarships, priority will be given to Colorado practitioners who have never attended a retreat previously, and to individuals earning below $30K per year, or families (legally married) making a combined income below $50K per year. Board members, advisors, family members, employees or contractors of the Eon Zen Center and the COMMON Foundation are not eligible for the scholarship. If you are interested in applying for the scholarship follow this link to the Eon Zen Center website and complete the application. Applicants for the scholarship will be asked to provide a short description of their intention in practice, as well as proof of financial need (tax return, or current pay stubs, etc.) to Sensei Paul Gyodo, Founder of the Eon Zen Center. Eligible submissions will be sent to the COMMON Foundation for final determination of the award. Once the event has been attended and confirmed by Eon Zen Center, the COMMON Foundation will issue a grant to Eon Zen Center to reimburse the cost of attendance. If you are interested in applying for a scholarship, please submit the form below and send income verification (tax return, or current pay stubs, etc.) to Eon Zen.